Prevents swinging doors from damaging RV awning fabric. Sorry to say this would not work on our trailer as there is a drip cap above the door. Otherwise the product seemed adequate for a door with no drip cap. 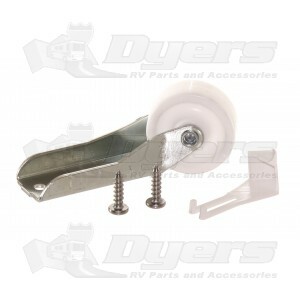 Was looking for specific awning roller. This product wasn't easy to find. Fortunately it was here! I know this whole review sounds cliché but it's honest and true. I needed a perfect fit roller so I didn't have to drill new holes into my camper door. This roller is the exact match for my 2007 Salem. Thanks for keeping up with the old stuff!